Mattel has updated their Facebook page with photos of the new packaging for He-Man and Skeletor, who’ll be offered for sale on Mattycollector.com in December (with slightly altered packaging–I think it’s just “The Original!” on the front there). So for those of you who’ve gotten on board the MOTUC Trak a little late, here’s your chance to own the big boys. Oh, good. These are the only two figures from the line I'm remotely interested in. Who knows, maybe I'll actually be able to get one of the damned things? Finally! I only need He-Man and Beast Man to bring me up to speed. Come ooooon Beast Man! I'm glad to see them since I missed them along with Beastman the first time around. TAO: I'm assuming it's an homage to the original line when "The Original" was put on later runs of He-Man and Skeletor that weren't wearing battle armor, thunder fists, and dragon blasters. So, you think they'll be released the same day as normal releases? And aren't there already two figures in November as it is? This is going to be one hell of a Christmas! Thankfully I only need He-Man of the two, but here's hoping for Beast Man and King Grayskull! They ship to Africa, right? 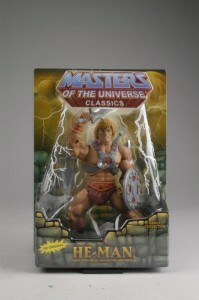 'Cause He-Man is the only figure I want from this series for now. That said, I'm looking forward to them even though I have the REAL originals. Do you know if they have lightened the paint around He-Man's eyes? I am hoping to get Webstor next month, if I am able to get him, and if I just love him so much I can swallow another $30, then I will want to get this He-Man. I'm interested in a Skeletor to go with my MOC Commemorative and 2002 Skeletors. 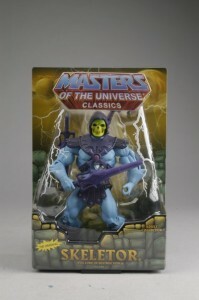 Does anyone know if there's any difference with Skeletor besides his hand? Homage to the original line or not, "original" is going to make a lot of ebay buyers think that these are the original releases. Then again, I guess it's an easy way to prove I have an original. I never quite understood the complaints about the left hand…my Skeletor holds the staff well enough if you place it higher up on the shaft, and for posing, I think it's a much cooler look than the closed hand shown above. Just my 2&#162. @Scott: I thought of that shortly after looking at these. I guess since this is a line directed toward adult collectors, Mattel figures the onus is on the collector to know the difference. In any event, adding more He-Man figures to the general population on eBay should lower prices, "The Original" regardless. And I imagine these two will have a pretty large run. Hopefully this is a sign that other figures will be re-released. I have decided I want a Tri-Klops but since I'll be flying back from GenCon that day I _know_ I will not get a Tri-Klops. Oooo! I'll grab these for sure. I only want them and Man-E-Faces when he gets made. yeah, that's 60 bucks of motuc in dec and 40 in nov… so much for xmas presents huh? any of us are on a budget are either taking these AS our xmas gifts, or not getting them. smart matty, thanks for that, always thinking about "the fans." Skeletor's left hand holds that staff fine, but he cannot hold any other weapon. Skeletor not being able to hold both halves of the power sword at the same time really irked! At least with the upcoming Scareglow, the wide grip makes sense with the Grayskull Scroll/key holder. I'm glad that these two are being offered again. I missed them the first time. Hope Beastman "returns" also. I'm gonna pass on these, but I am kinda tempted to get the He-Man rerelease just for the sake of better face paint. But since we're gonna get Battle Armor He-Man in January, I'm just gonna replace heads and be fine with my 1st release He-Man. The open Skeletor hand was a disappointment for me. Just like with 200x Skeletor, the widening staff tends to widen the hand as well. I'm quite happy they didn't recycle than hand for Webstor. Though it would've fit for Zodac. My own selfish reasons aside, I'm glad they're commiting to a re-release so fans who did not have the opportunity to get either one and have been wavering about whether or not to collect the line or not will finally get one and join in! The Skeletor hand never really bothered me, but I guess if this is something that other people are happy about then its a good thing. This great. I came in 6 figures late and I dislike the Ebay scalpers who want $100 extra for a figure. I really love these classics. I can't wait to have He-man on top of Battle Cat.